What’s cooler than Google Glass? Almost anything, really, but something that is both cooler and smaller and still eyeball-centric is a patent for a camera-containing contact lens, filed by Google in late 2012. The patent was published March 27. Sensors on the contact lens would detect blinks and respond to commands based on those blinks. 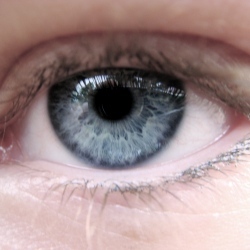 The camera sits below the pupil on the contact, so it shouldn’t obstruct vision. Because the camera is on the eyeball, it follows the wearer’s gaze, potentially recording anything he or she sees, as he or she sees it. One of the uses discussed in Google’s patent is giving a sense back to blind people. While a blind person couldn’t gain sight from the contact lens, the camera could, for example, detect approaching traffic and then wirelessly communicate with another device the blind person was carrying. When paired with facial recognition software, the contact lens could identify a nearby person and transmit that information to an earpiece.